A wide range of weather based indices are available, based on accumulated precipitation alone, as well as precipitation combined with modeled evaporation and/or transpiration rates. These include spatial representations of soil moisture, vegetative stress, agriculture, and water supply. Many can be found using the assessment resources listed below. Standardized Precipitation Index (SPI) is the number of standard deviations that the observed value would deviate from the long-term mean. Since precipitation is not normally distributed, a transformation is first applied so that the transformed precipitation values follow a normal distribution. Quantitative Precipitation Estimate (QPE) show spatial distribution of precipitation are multi-model estimates. Using a multi-sensor approach, it is one of the best sources of timely, high resolution precipitation information available. National Fire Danger Rating System (NFDRS) includes the 1000-hr time lag fuel moisture, Energy Release Component (ERC), Growing Season Index (GSI), and Keetch-Byram Drought Index (KBDI) among its outputs. See Fire Danger Section. Canadian Forest Fire Danger Rating System (CFFDRS) includes the Duff Moisture Code (DMC), Drought Code (DC), and Buildup Index (BUI) among its codes and indices. See CFFDRS Section. The US Global Climate Change Research Program (USGCRP) is mandated by Congress in the Global Change Research Act (GCRA) of 1990 to assist the Nation and the world to understand, assess, predict, and respond to human-induced and natural processes of global change. NOAA Climate.gov is a source of timely and authoritative scientific data and information about climate. It provides news items, maps and data, and teaching resources. 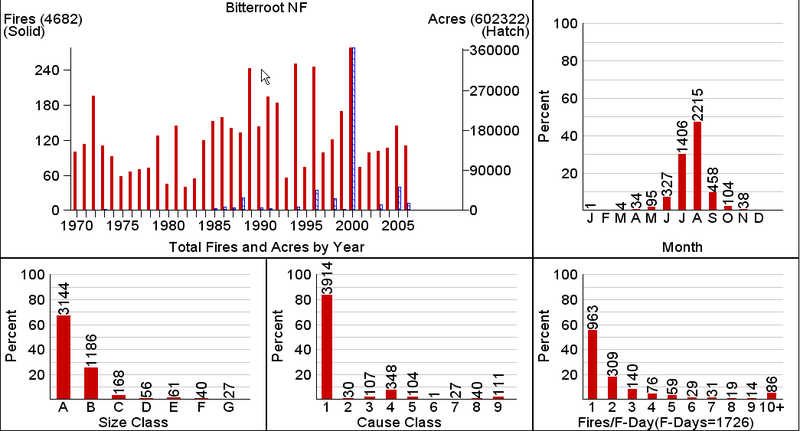 FireFamily Plus depictions of fire occurrence patterns are good for evaluating ignition patterns, but may provide little insight to climatology and fire growth in regions where incidents commonly exhibit multiple growth events during extended periods of active fire behavior. Use Appropriate Fire Potential Indicators (ERC, BUI) and determine season start, peak season, shoulder seasons, and season end. Evaluate and depict current conditions spatially, using a combination of drought assessment resources appropriate for the area of interest. 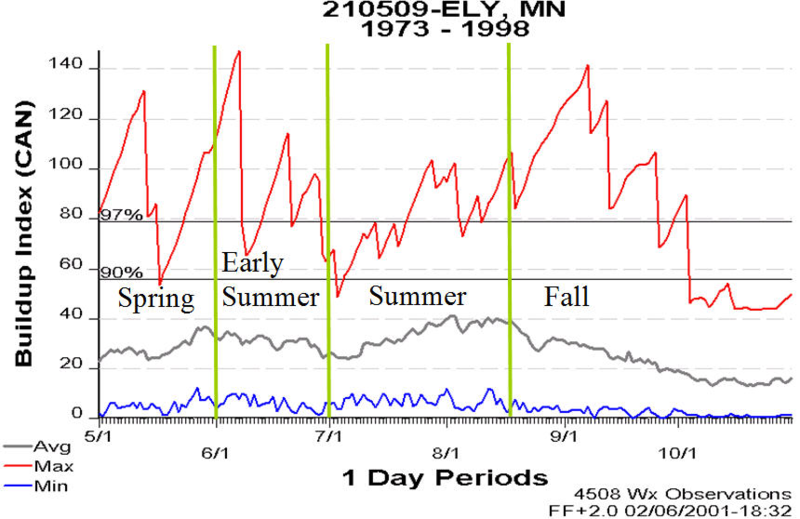 Graphical Time Series depictions can highlight seasonal departures from norms and exceptional events. This FireFamily Plus Climatology graphic includes historic range (average, max, min), current year, and analog year. Consult with local managers and experts. Get their help evaluating the objective analysis and to identify any local anomalies that may not be apparent. 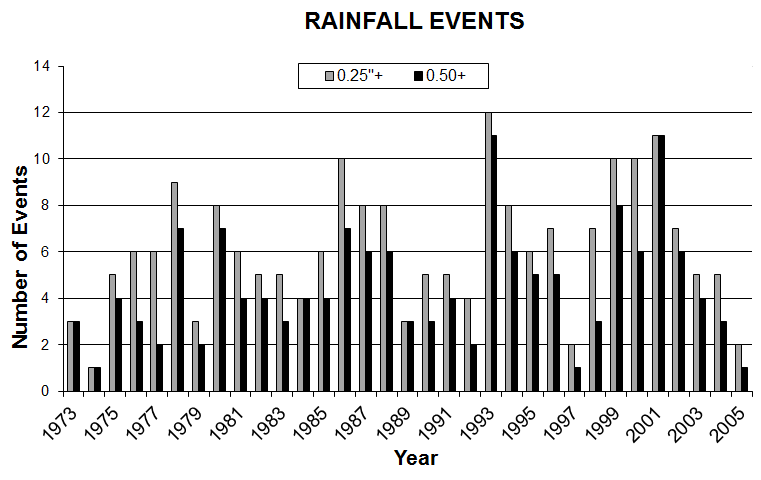 Originally reported by Latham and Rothermel (1993) from opinions of persons familiar with fire and fire weather in the Northern Rockies, example criteria were suggested as 0.5 inches of rain accumulated in 5 days or less. 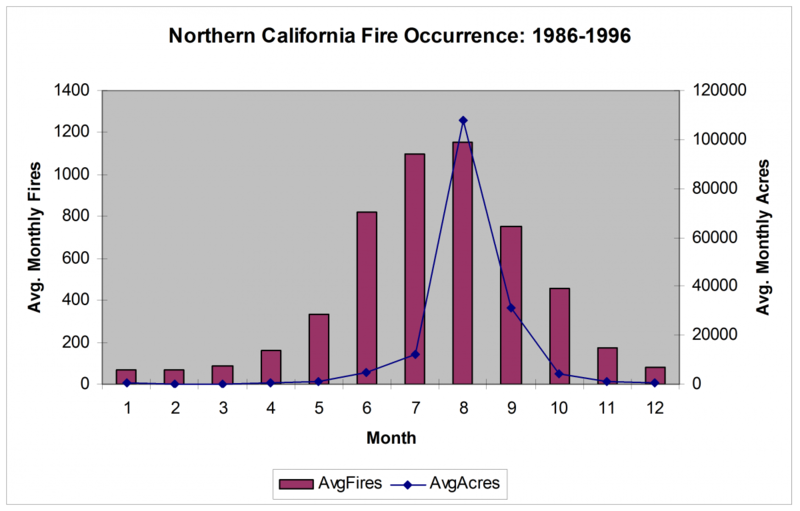 However, other fire potential indicators, such as cloud cover and relative humidity, can help identify periods of continuous low- or no-spread days during a fire season in a locality. These discrete events may not signal the end of the fire or the season. 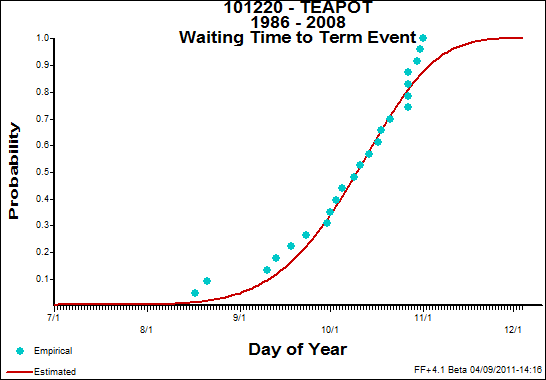 As such, it may be just as important to identify the frequency with which they occur and the duration of their influence as it is to predict a waiting time for the next event. 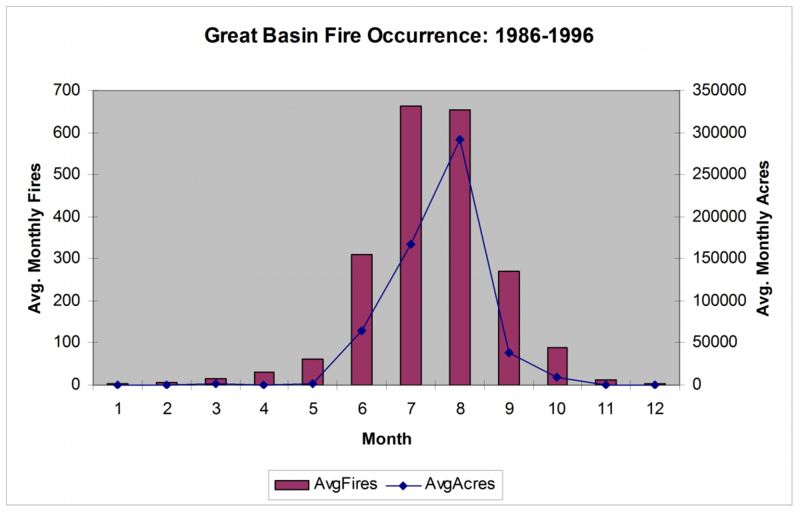 It is possible to identify the date in a fire season when fire growth is no longer likely or possible. This is generally understood to be the season end. 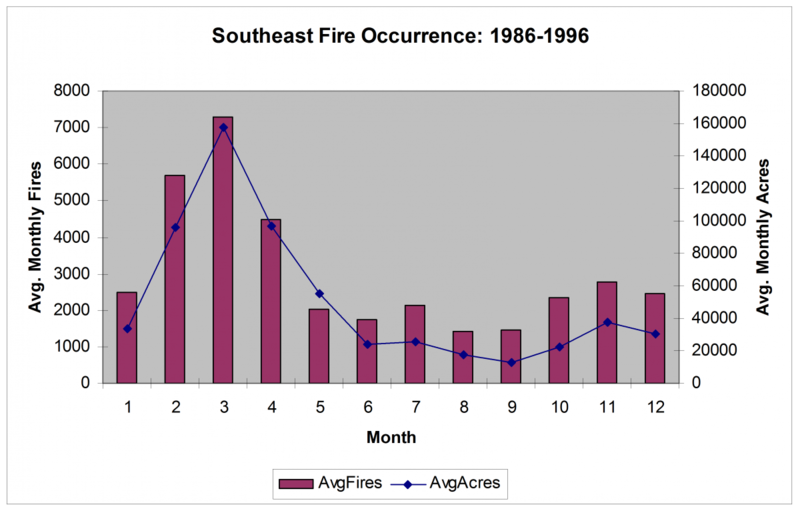 If a fire’s threat to values of concern is more imminent or it is early in the fire season, a prediction of the season end may be less important than suggesting if and when a weather event will put the fire out. 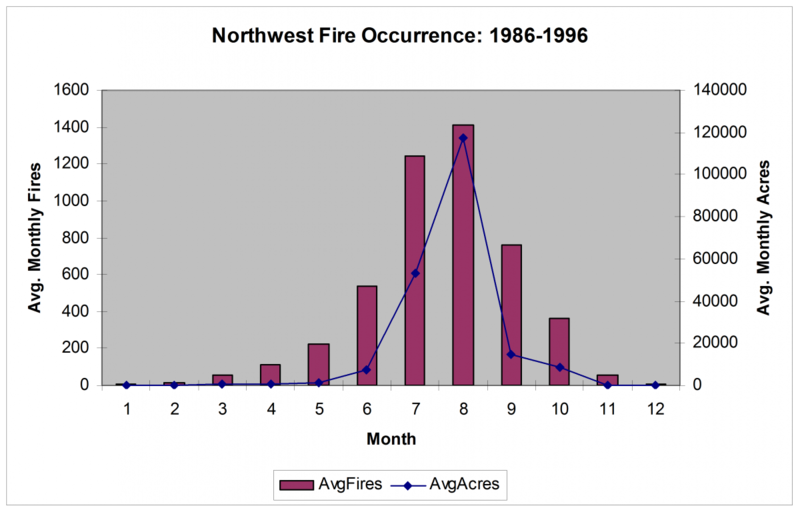 In bimodal seasons, such as the spring seasons in the southwest and the lake states, weather criteria can suggest fire ending dates in the early “season”, even though fire potential is expected to rise again in subsequent periods. Anticipating this date may be critical to strategic decisions as the season end approaches. As suggested above and depicted here, it may be valuable to identify the frequency of fire slowing or stopping events, especially if they are more common, such as in the eastern U.S. FireFamily Plus Event Locator can be used to evaluate data from a local RAWS station. FireFamily Plus (version 4.1) includes a TERM tool, in the Weather menu, to produce a waiting time distribution of historic fire- or season-ending dates. For each year evaluated, a single date is selected as the ending date based on established criteria. 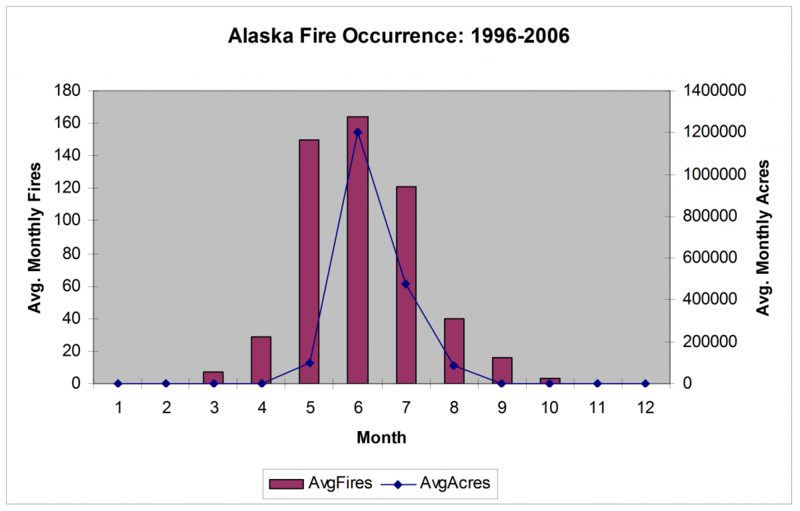 These dates are recorded and the distribution plotted to estimate the probability that the fire or season will end by a specific date. The basic climate/weather factors temperature (hot vs. cold), atmospheric moisture (dry vs. moist), and wind patterns affect the fuel conditions and the tendency for fire start and spread. Fire season characteristics are driven by seasonal and continental-scale weather patterns, their movement, and variation. Seasonal air mass and jet stream changes affect various regions at different times and in different ways. The following will be key words and catch phrases meteorologists typically use to describe critical fire weather growing and slowing patterns. These terms will often be used to explain weather patterns but not exclusively used. The terminology will often be found in National Weather Service Area Forecast (AFD) and fire weather planning forecast discussions as well as Predictive Service 7-day outlook assessments. Winter – generally very cold and dry. Summer – warm and dry with lightning in June, then gradually moistening. 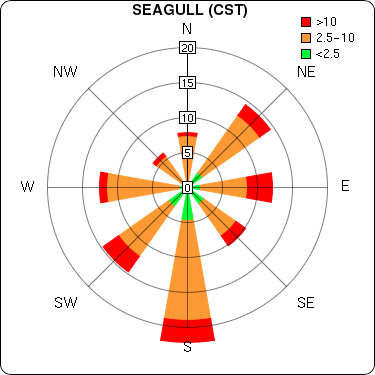 Occasional wind events. Fall – moist initially, then back towards winter conditions. Foehn and Downslope wind - Glacial Katabatic downstream from glaciers, e.g. Juneau fjords, Alaska Range Chinook in the western Tanana Valley, Hillside Katabatic Winds, e.g. Anchorage Bowl, and Yukon Chinook winds in the eastern interior and through the Brooks Range. Breakdown of the Upper Ridge - Boreal interior area from Galena to Fort Yukon, warming-drying ahead of the low-pressure system originating from the Sea of Okhotsk with gusty W-SW winds, and Low Pressure moving inland and loses wetting characteristics but keeps enough moisture for drier storms. Closed low/occluded low is a low-pressure system that originate from the Sea of Okhotsk and Bering Sea moves inland and stays for a multi-day period or a persistent moist southwest flow impacting the coastal areas. Marine Inversion: coastal areas of Alaska especially during night. Winter/Spring – cool and moist with frequent and abundant precipitation, especially western portion of area. Relatively dry east. Summer – some windy and dry potential early, then becoming generally warm and dry with infrequent wind events due to dry cold fronts. Fall – return of cooler, more moist conditions ushered in by a period of windy, dry conditions with cold frontal passages. Potential for dry offshore wind events behind storm systems. Fire activity peaks in summer due to increasingly warm and dry conditions and potential for wind and lightning with dry cold frontal passages. Rapid decrease in activity in fall with Pacific moisture on the increase, though this the peak period for dry offshore wind events and a few dry cold front passages are still possible. Little to no activity late fall through spring. Winter/Early Spring – cool and moist with regular precipitation events, especially in the mountains. Late Spring/Summer – some windy/dry potential early, then generally warm and dry with infrequent wind events due to dry cold front influences. Fall – return of cooler, more moist conditions ushered in by a period of windy, dry conditions with cold frontal passages. Potential for dry, north through east wind events behind storm systems. 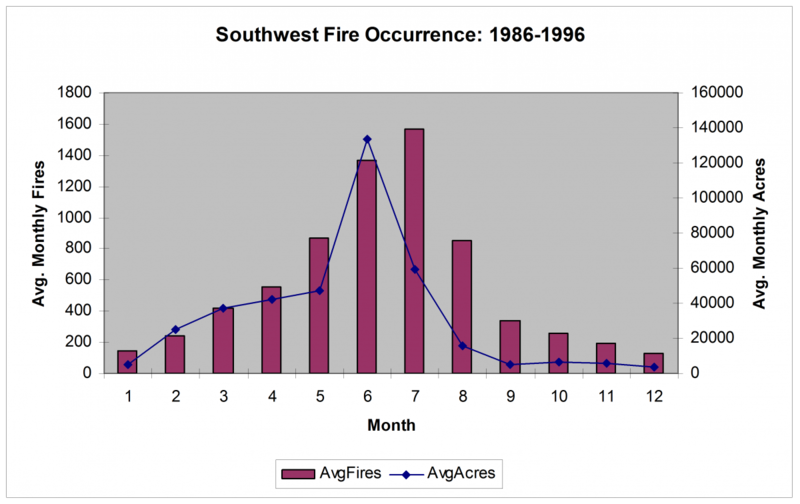 Fire activity peaks in summer due to increasingly warm and dry conditions and potential for wind and lightning with infrequent dry cold frontal passages. Rapid decrease in activity by late fall with Pacific moisture on the increase, though peak period for dry northeast wind events. Little to no activity late fall through early spring. Winter – occasional storm systems with mainly mountain precipitation. Inland intrusions of cool, moist Pacific air. Relatively dry inland lower elevations. Spring – less frequent precipitation events and substantial inland intrusions of marine air. Summer - hot and dry inland and maritime influence along coast. Occasional influx of monsoon moisture from southeast. Fall – end of any monsoon moisture influence and begin of gradual inland shift in marine air mass. Period of greatest potential for dry offshore wind events. 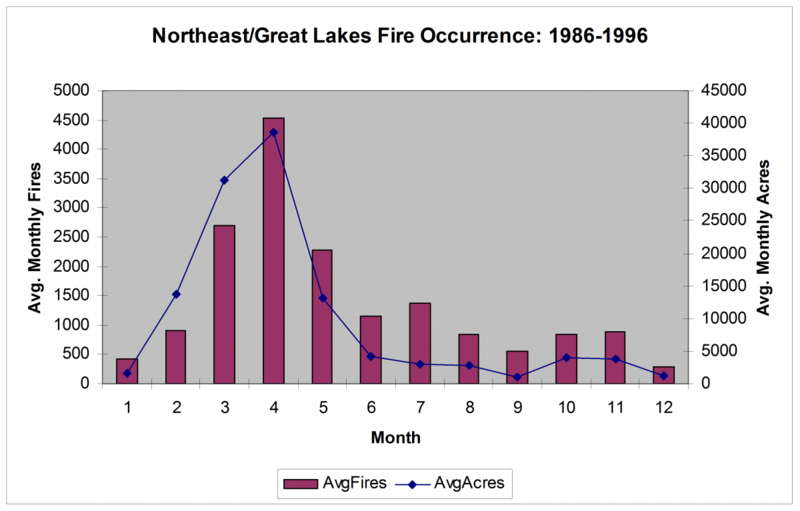 Fire activity peaks late spring through fall, when influence of maritime air is diminished. Greatest potential for offshore wind events in the fall, when fuels are often driest. Little activity winter-early spring due to maritime influence. Fires possible at any time with offshore wind events. Winter – cool to cold with occasional precipitation. Dry, downslope winds possible in lee of Rockies. Spring – warming, windy and dry transitioning to hot and dry. Summer – hot and dry gives way to warm and moist abruptly with monsoon. Fall – turning much drier and mild. Potential for few wind events followed by dropping temperatures. Fire activity increases in spring as it transitions from windy and dry to hot and dry. Peak from May – mid-July, with monsoon thereafter. Rare secondary fall season as moisture exits and jet drops south and wind event potential returns. Little activity late fall - early winter. Winter – periodic precipitation, mainly over mountains. Spring – becoming windy, dry, and warmer. Summer – hot and dry. Periodic wind events north and moisture surges south. Fall – period of windy and dry conditions often followed by period of fair and dry weather before cooler temperatures and increased precipitation potential. Generally fine fuel types, fire season dependent on cured fuels and windy/dry conditions. These conditions occur almost exclusively in the summer. Little to no activity outside of summer. Winter – regular storm systems and precipitation, especially over mountains. Cold overall with potential for artic air intrusions. Spring – period of heaviest precipitation in the mountains, but greatest Chinook wind potential in lee of Rockies and adjacent plains. Summer – warm and dry over most mountain areas with occasional wind events north. Increasingly moist across the plains and far south. Fall – period of windy/dry potential, then fairly dry and mild until temperatures drop and moisture increases. 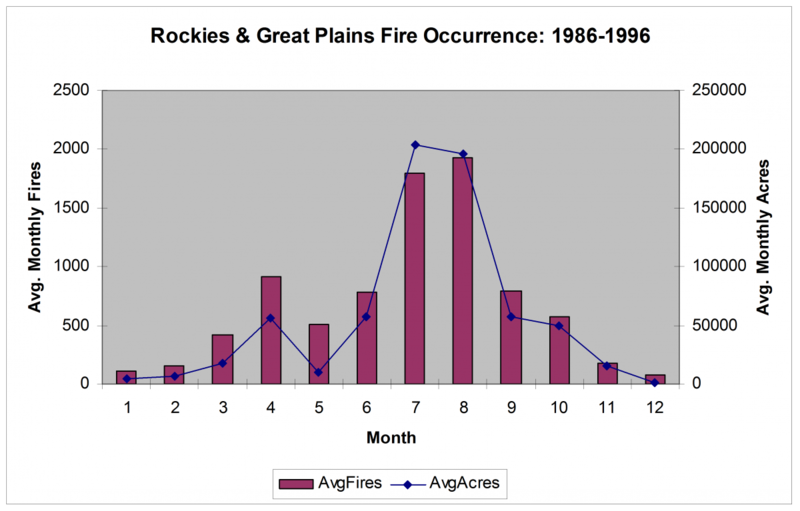 Fire activity on the plains peaks in spring and fall when windy/dry periods are coincident with dormant or cured fine fuels. Fire activity in the mountains peaks in the summer, when it’s warmest and driest and some dry cold frontal passages are possible. Winter – generally cold with dry periods between widespread periodic precipitation. Spring – warmer, windier, and drier. Driest immediately behind storm systems. Summer – generally warm and humid under Bermuda High influence. Occasional windy/dry events far north. Fall – turning much drier, then generally mild and dry with potential for windy and dry periods before temperatures drop. Winter – generally driest time of year with greatest wind event potential behind passing storms, though widespread precipitation can also occur. Spring – windy/dry potential retreats north, and warm, moist conditions become increasingly dominant. Summer – warm to hot and humid with light winds. Occasional dry spells. Tropical cyclone activity increases late in the season. Fall – very moist initially, then gradual infiltration of dry air. Moist conditions often persist along Gulf Coast. Fire activity maxima in late winter / early spring and fall, coincident with greatest potential for windy/dry conditions behind passing storm systems. Dormant fine fuels with low live fuel moisture in winter and spring, leaf-off in fall in northern portion of region. Season can extend year-round anytime warm/moist air becomes suppressed south and east. 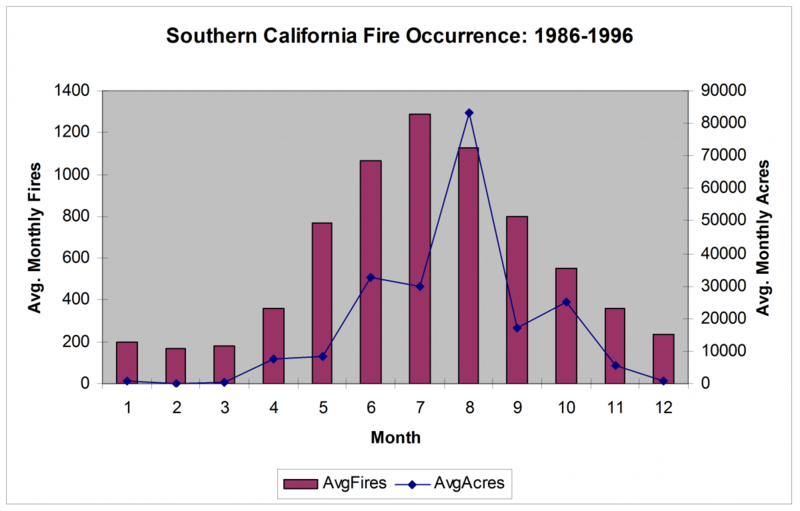 Usually little activity summer months, though significant fire activity has historically occurred during unusual dry spells.